This extra long collection of 121 Christmas stories will warm readers’ hearts and spread the wonder of the holiday season with its tales of love, joy, and awe. A great holiday gift packaged with a photo frame and bookmark. Chicken Soup for the Soul: The Gift of Christmas will delight readers with its stories about the joy, wonder, and blessings of the holiday season. This special collection is filled with joyful, heartwarming and merry stories about holiday traditions, family, and goodwill that the whole family will enjoy. 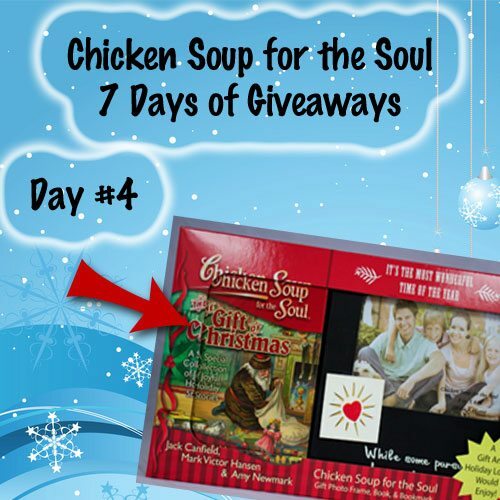 Also if you win any of the seven giveaways you will be entered to also win a Chicken Soup for the Soul personalized hardcover book from Blurb! So one lucky winner will win two prizes! This Christmas book would be great. Christmas is kind of a hard time for me and reading inspirational stories help. Thanks for this chance.